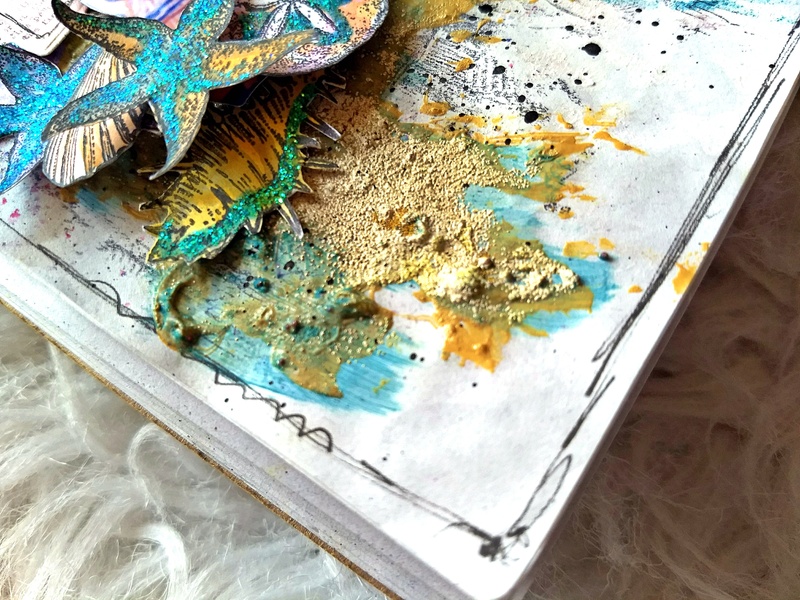 Ask any mermaid you happen to see, who makes the best journals Kate! Our temps aren’t as extreme as yours, but we’re breaking records for cold one day then having highs near 80 the next. So strange. What you write about yourself resonates with me. I too am slow-paced and quite laid back i might say. I’m also a nurse and i trained to be a midwife, but never really practiced it, as once i was qualified I found it too stressful. The last 23 years I have been a specialised palliative care nurse in a British hospice. (Am now retired). Your mermaid pages are utterly beautiful and mesmerising. Well done. Another ‘well done’ for your number one son! Good lad! I bet you are proud mum. A fantastic spread again dear Kate – and wow- what a little genius he is! You can be very proud of him! Super! Saw your entry at Stamplorations – lovely journal – and congrats to your son – that is a very wonderful honor! His hard work paid off – super! Your pages seem to get more beautiful every time !! A great big congrats for your son, wow! You must be so proud! A magical journal spread and your post today will relate to how many of us mums have felt when taking care of their families. You must be so proud of your son and his achievement. 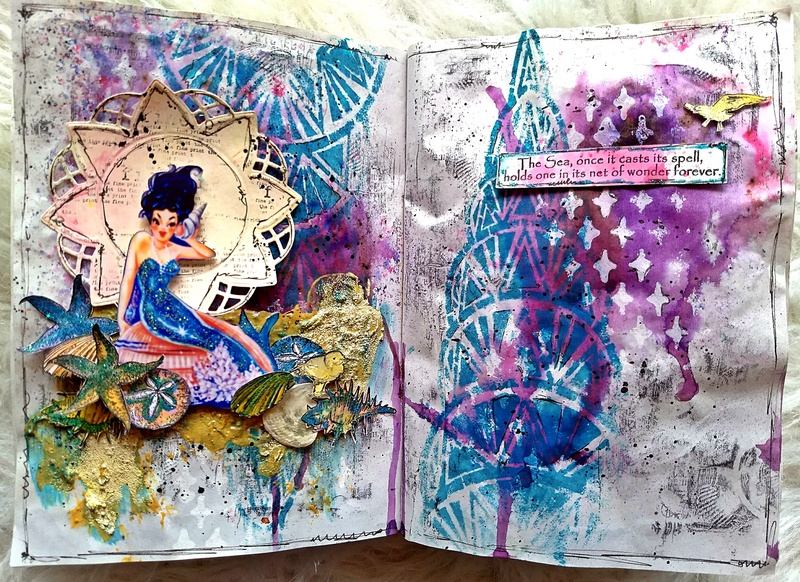 Love the rich and vibrant colors of your mermaid page. Originally, I wanted to be a doctor. Opportunities didn’t quite go as I had planned. Over the years, I realized what I wanted was a job that was important and mattered. that’s what happened when I became a mom. Congrats to your little scientist. another gorgeous and magical page Kate. Congrats to your handsome and smart son!! You’ve expressed the sentiments of being a mom very well. Happy T Day! What a great post, dear Kate. I can’t begin to imagine what it’s like to be a mother, but I remember the time I had a guest staying with me who threw my cat outside saying something like “cats need to be outdoors, not inside all day long.” My cat had never been outside before and I went off on the person. Needless to say, the same person left the next day and never returned. So, I can understand your protective nature. Your mermaid today is beautiful. She sparkles and shines in a way that lights up the page. Your son must be pretty special to receive that much money. 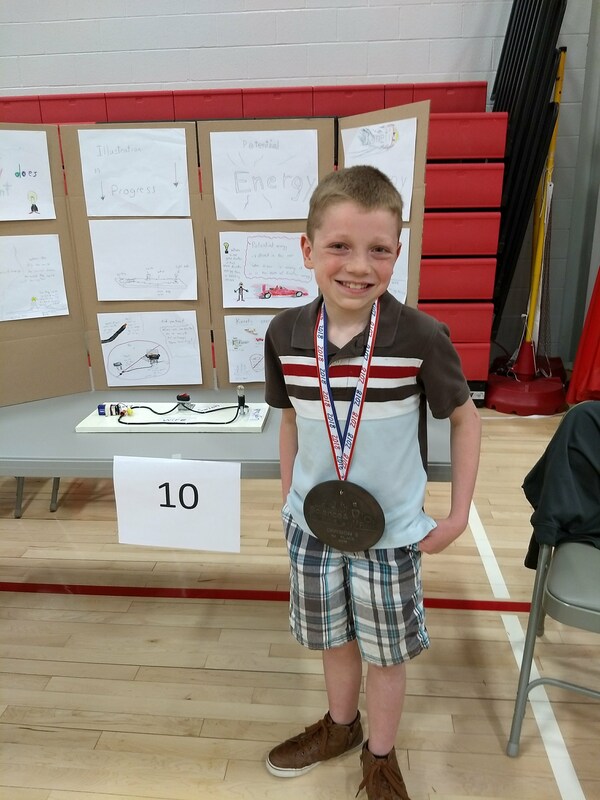 Our schools don’t have any money, so even science projects get little attention. 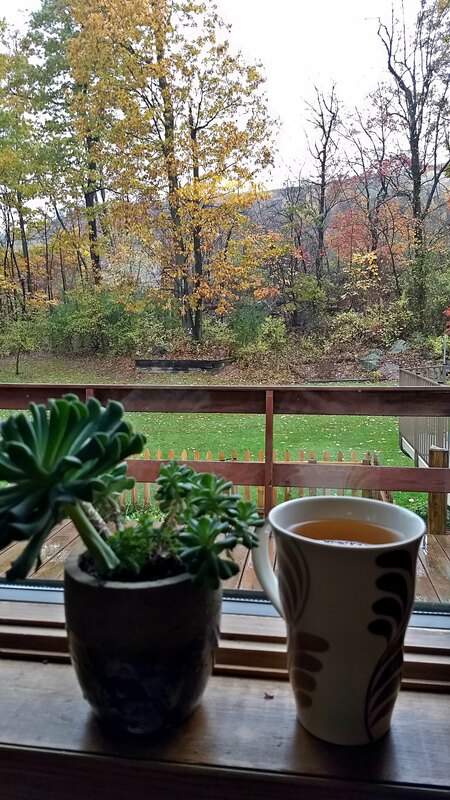 Thank you for sharing your recycled tea mug with us for T this Tuesday and to answer your question about the fossils, if they had been flattened, they could be hung from windows or placed on walls. I plan to use some to hold little bits like thumb tacks. Divers and Sundry suggested they would look good holding rings on night stands. Ideas are endless. Kids will love making them. you really have wonderful stencils! 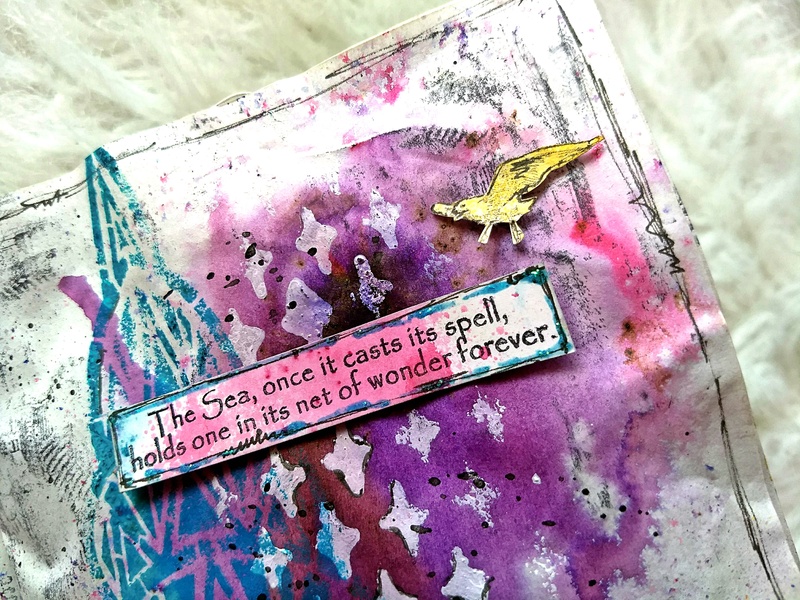 this is another great spread in your mermaid Journal, it really must be a great treasure meanwhile. congrats to you son winning such a great prize – of course you are proud of him!! Such a beautiful piece again today, your Mermaids are all so gorgeous! love the bit of sparkle too. congrats to your little man on his award- impressive prizes. good for him! You write so beautifully, Kate. Your words always make me think and sometimes remember. We didn’t have digital cameras when my son was born and film developing was very expensive. So I have a gazillion mental snapshots in my head. It surprises me that there’s still room for anything else – lol. I love all the layers in this beautiful spread. Wow, congratulations to your son! He’ll grow into that medal, I’m sure. He sounds wise beyond his years. Congrats to the little man on hi BIG WIN!!! That is an impressive about of money to win for any age!!! Love your journal layout! You do Mermaids proud! Your mermaid page is beautiful! One of my favorites….do I say that with everything you make? Probably since I love everything you create. This is such a gorgeous piece of art and a tender and sweet post to match! I love how you reminded me to enjoy the little moments with those little ones who grow up all too fast. And wow! This is such a visually moving page. The colors really spoke to me and I love all the clever layering you did. So fun to see this combination post of family and art! A joy all the way around and I’m so glad you took the time to share your talents with us for this week’s Simon Says Stamp Monday Challenge! I like how you used the die cut behind your mermaid. Really highlights it.